In a 17-mile circular tunnel underneath the border between France and Switzerland, an international collaboration of scientists runs experiments using the world's most advanced scientific instrument, the Large Hadron Collider (LHC). By smashing together protons that travel close to light speed, particle physicists analyze these collisions and learn more about the fundamental makeup of all matter in the universe. In recent years, for instance, these experiments showed data leading to the Nobel Prize for the discovery of the Higgs Boson. Now, a team of high-energy experimental particle physicists, including several from the University of Kansas, has uncovered possible evidence of a subatomic quasiparticle dubbed an "odderon" that - until now - had only been theorized to exist. Their results currently are published on the arXiv and CERN preprint servers in two papers that have been submitted to peer-reviewed journals. "We've been looking for this since the 1970s," said Christophe Royon, Foundation Distinguished Professor in the KU Department of Physics and Astronomy. The new findings concern hadrons (the family of particle that includes protons and neutrons), which are composed of quarks "glued" together with gluons. These particular experiments involve "collisions" where the protons remain intact after the collision. In all previous experiments, scientists detected collisions involving only even numbers of gluons exchanged between different protons. "The protons interact like two big semi-trucks that are transporting cars, the kind you see on the highway," said Timothy Raben, a particle theorist at KU who has worked on the odderon. "If those trucks crashed together, after the crash you'd still have the trucks, but the cars would now be outside, no longer aboard the trucks - and also new cars are produced (energy is transformed into matter)." In the new paper, researchers using more energy and observing collisions with more precision report potential evidence of an odd number of gluons, without any quarks, exchanged in the collisions. "Until now, most models were thinking there was a pair of gluons - always an even number," said Royon. "Now we measure for the first time the higher number of events and properties and at a new energy. We found measurements that are incompatible with this traditional model of assuming an even number of gluons. It's a kind of discovery that we might have seen for the first time, this odd exchange of the number of gluons. There may be three, five, seven or more gluons." The KU researchers explained the odderon can be seen as the total contribution coming from all types of odd gluon exchange. It represents the involvement of all of three, five, seven or other odd number numbers of gluons. By contrast, the older model assumes a contribution from all even numbers of gluons, so it includes contributions from two, four, six or more even-numbered gluons together. 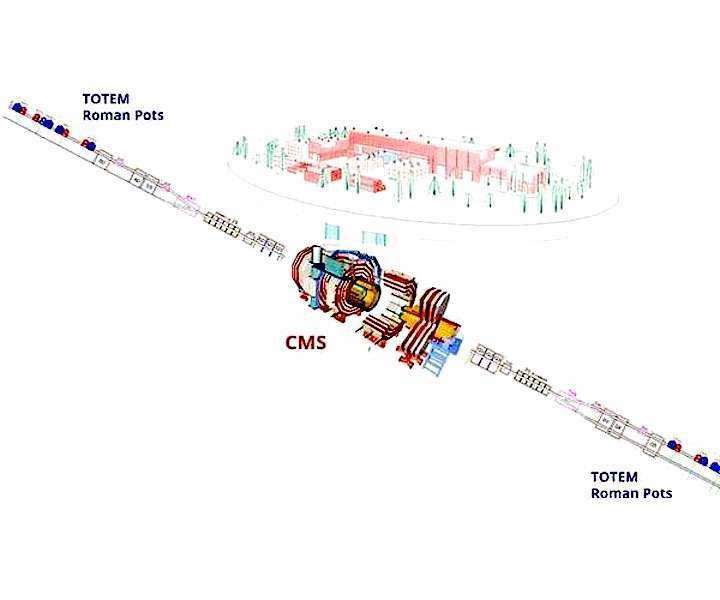 At the LHC, the work was carried out by a team of more than 100 physicists from eight countries using the TOTEM experiment, near one of the four points in the supercollider where proton beams are directed into each other, causing billions of proton pairs to collide every second. KU researchers said the findings give fresh detail to the Standard Model of particle physics, a widely accepted physics theory that explains how the basic building blocks of matter interact. "This doesn't break the Standard Model, but there are very opaque regions of the Standard Model, and this work shines a light on one of those opaque regions," said Raben. Physicists have imagined the existence of the odderon for many decades, but until the LHC began operating at its highest energies in 2015, the odderon remained mere conjecture. The data collected and presented in the new paper was collected at 13 teraelectronvolts (TeV), the fastest scientists have ever been able to collide protons. "These ideas date back to the '70s, but even at that time it quickly became evident we weren't close technologically to being able to see the odderon, so while there are several decades of predictions, the odderon has not been seen," Raben said. According to the KU researchers, the TOTEM experiment was designed to detect the protons that are not destroyed by the collision but are only slightly deviated. So, the TOTEM particle detectors are placed at a few millimeters from the outgoing beams of protons that did not interact. By comparing current results with measurements made at lower energies using less powerful particle accelerators, TOTEM has been able to make the most precise measurement ever. The co-authors compared the ratio of signatures from collisions at various energies to establish the "rho parameter," one measure that helped build evidence for the possible presence of odderons. "If you go to really high energies, there are signatures of the behavior of beams collided at a high energy that can be measured," said Raben. "But there are different types of high-energy growth signatures. Up until now, we've only had to think about one type of high-energy growth behavior. Essentially these quantities might change as a function of the amount of energy. The rho parameter is essentially measuring the ratio of one signature to another of this high energy growth." Such measurement of the rho parameter is owed to the shared work, collaboration and key contributions, on the detectors' hardware and in particular on the physics analysis, by several postdocs and senior physicists. Aside from Royon, KU personnel involved in the new TOTEM findings include postdoctoral researcher Nicola Minafra, who earned a CMS achievement award this year, and graduate students Cristian Baldenegro Barrera, Justin Williams, Tommaso Isidori and Cole Lindsey. Other KU researchers participating in the work are Laurent Forthomme, a postdoctoral researcher also based at CERN and working on the CMS/TOTEM experiments, and graduate student Federico Deganutti, who works with Raben on theory. "Our students come from many different nations," said Royon. "KU is a working at the frontier of new things, and we expect big results in the coming months or years. Other research efforts include looking for an extra dimension in the universe, but for now we're just looking at the data." Royon said the TOTEM experiment's fast-timing detectors used to measure the time-of-flight of protons in the LHC could see many applications in medicine, space physics with NASA to measure cosmic rays, and desalinization of seawater, a concept that the KU physicist is exploring with Mark Shiflett, a Foundation Distinguished Professor in the KU School of Engineering.